When it comes to Disney movies, 2019 is a year like no other. I don’t know that there has ever been a year where I was this excited for every. single. movie. slated to release in a 12 month period. March delivers the first two (out of 10 this year) and they are Captain Marvel and Dumbo. And while, y’all KNOW we love some Marvel in this house, I need to focus on my favorite big-eared elephant for a minute. Update: Dumbo is here and so is my Dumbo Movie Parent Guide. Check it out! My affiliate links are below, which means I may earn money from purchases made. I love Dumbo. This is well-documented. But, my kids have never seen the original movie. They have been on the attraction and know a little bit about the story, but we haven’t all watched it together as a family. That ends now! 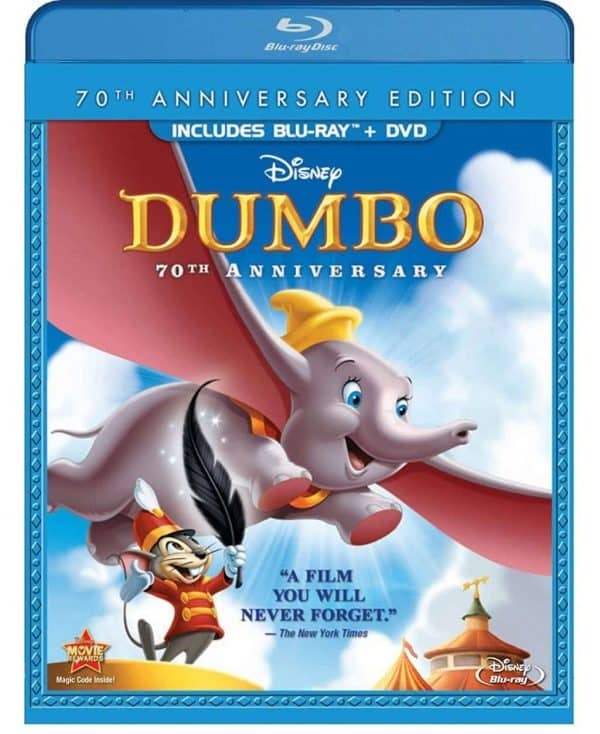 I bought a copy of the original Dumbo on Blu-Ray and DVD and decided to share the love. So two copies made it into my cart and I’m giving one of them to one of you! But before I do that, you have to see these new posters. Like I am legit trying to figure out where the circus room will be in my house so I can hang them up. I’m obsessed with those circus tent stripes. 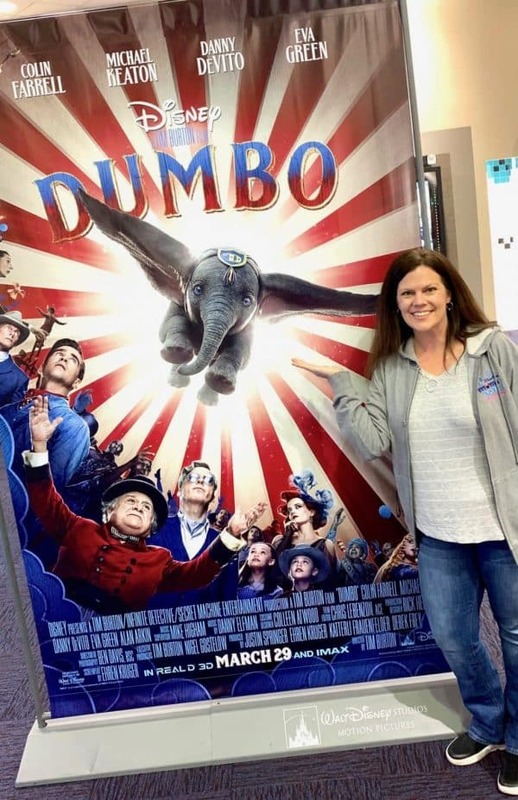 While the internet was abuzz with the 2019 Walt Disney Studios Motion Pictures slate yesterday (which is amazing and I can’t say that enough and you can read all about it on my girl Patty’s blog), Disney quietly slipped these fantastic new Dumbo posters into your feed. I want them all. And I should say that I’m not one to get super hyped for a poster, but come on. Come on! See the all-new character posters for Disney’s @Dumbo featuring Colin Farrell, Michael Keaton, Danny DeVito, Eva Green, and your favorite flying elephant. #Dumbo soars into theatres March 29! There are five new posters so be sure to click through so you can see them all! Of course Dumbo is my favorite. How did they get his eyes so perfect? Giveaway time! If you’re like me and want a refresher on Dumbo, enter to win a copy of the original animated film by commenting below with what you are most excited to see in the new version. New characters? Dumbo? The sets? That Tim Burton spin? Let me know! That’s it! One winner will be randomly selected from the comments and notified via email. Please reply within 48 hours or I will have to pick a new winner. US entries and age 18+ only please. Good luck! Entries accepted until 11:59PM ET on 1/18/19. I can’t wait to see the new version, but love the old one as well. I can’t wait to see the characters in the new movie. I’m excited to see dumbo and his little personality come to life in a more realistic way! I watched the trailer and can’t wait to see the movie now. Dumbo is adorable! I can hardly wait to see a real elephant fly. I am so glad they made a new Dumbo film. I enjoyed it so much when I was young. I am excited about Tim Burtons spin. I know I am going to love it! I would love to see what Tim Burton does with it. Tim Burton remaking a classic. This has to be superb. Can’t wait. I’m curious to see how they film Dumbo flying in live action. That will be interesting. I’m excited to see the new characters and see what’s different in the new movie. The old Dumbo will always be one of my favorites! I have always loved Dumbo. I am super excited about the new Dumbo movie coming out. Disney and Tim Burton can only turn out magic. I saw the trailer, and this live action version of Dumbo looks amazing! I am excited to see Dumbo and all the new characters. Thanks for a fun giveaway. I really enjoy how lifelike they have made Dumbo….great eyes. Our grandchildren are very excited to have time with us to view the movie. Watching this original movie with them will be great and will bring back many memories of me getting to watch it with my parents (and a tub of popcorn!). I would love to see the Dumbo character. I’m just excited to see everything about the movie. The cast, setting, and dumbo look amazing. I hope the story is good too. I’m excited to see the new characters. Loved the original. Cannot wait to see this one! I am interested to see how Tim Burton interprets the classic Dumbo story. I must say, though, that while I have been a Tim Burton fan for many, many years, and think his classic films like Beetlejuice, Corpse Bride, and Edward Scissorhands are brilliant, I have been disappointed with his more recent films. Hopefully Dumbo has inspired Mr. Burton to make his films great again. Thank you for the chance to win. We cannot wait to see this movie – my goodness, his eyes!!!! What a classic! Excited to see this but nervous it won’t do the original movie justice. Dumbo has always been sacred to me, so I was slightly upset when I heard Tim Burton was redoing it. As much as I love Tim Burton twists, Dumbo was a sweet movie that I did not want to have a twist. However, when I saw the teaser trailer, I actually felt excited about it! The actors & the modern movie magic will make it magical. I’m so excited to see it! I still have my VHS copy of the original! Unfortunately, I haven’t upgraded to DVD yet, but definitely need to because I know my girls would love it. Especially since the new one is coming! I am looking forward to seeing the cast!! I love Dumbo!!! I am really interested to see the characters especially Dumbo. I am most excited to see dumbo fly! I am most excited to see Dumbo again and see him fly. My childhood memories. I am excited to see the character Dumbo itself! The Tim Burton spin has me excited. I am most excited to see the way Tim Burton shows this. His creativity is through the roof. I’m so excited to actually see Dumbo the elephant himself. I can’t wait for my son to experience this movie, he’s never seen the original so he will be thrilled. I am excited to see the new characters! I’m excited to see how it differs from the original.